Since my dad has made this tabouli three times in the three weeks since I’ve been home, I finally decided to post it. While I haven’t participated in every single step of the tabouli-making process, I’ve done enough of it to confidently assure you that it is straightforward to make and delicious to eat. This recipe comes to us from Mollie Katzen’s The Moosewood Cookbook (the original, not “The New Moosewood”), a lovely book with parchment-like pages and hand-written recipes (or at least fonts made to look handwritten). My parents have made Moosewood’s tabouli every summer for as long as I can remember. The freshness of the citrus and vegetables plus the lightness of the bulgur wheat and the bite of the garlic make it perfect for a hot summer’s day — and we’ve had a lot of those recently. It is great alone for lunch, or alongside barbecued chicken for dinner. Like many of the best recipes, this one is open for experimentation and variation. We generally use what’s in the fridge and on the counters — sometimes green pepper, sometimes summer squash, maybe feta and maybe not. In my eyes (mouth? ), the tabouli must have tomatoes and chickpeas. We always use way less salt and way more garlic than is called for; adjust everything to your taste. I’ll give you my favorite version of the recipe and let you take it from there! Put the bulgur wheat into a large bowl and stir in the salt; pour the boiling water over the bulgur, cover the bowl, and let it stand for 15-20 minutes. After the bulgur has soaked up the water, stir in the citrus juice, garlic, mint, olive oil, and ground pepper. Cover and put in the fridge for 2-3 hours to marinate. Just before serving, add the chickpeas, diced/grated vegetables, parsley, and feta (if using). Mix to combine and enjoy! This entry was posted in climate, family, food, full meals, health, recipes and tagged Middle Eastern on 25.07.2013 by taplatt. If you’ve been reading food blogs recently, you may have noticed quite a few recipes for dukkah floating around. This is an Egyptian spice/nut/seed mix that is traditionally consumed by dipping a hunk of bread in olive oil and then into the dukkah. I found that it is delicious stirred into this couscous salad, atop other salads, and mixed into yogurt for a savory snack. It’s also good as-is, out-of-hand. Whichever way you choose to consume your dukkah, know that it is super easy and quick to make and can be made in any number of ways. 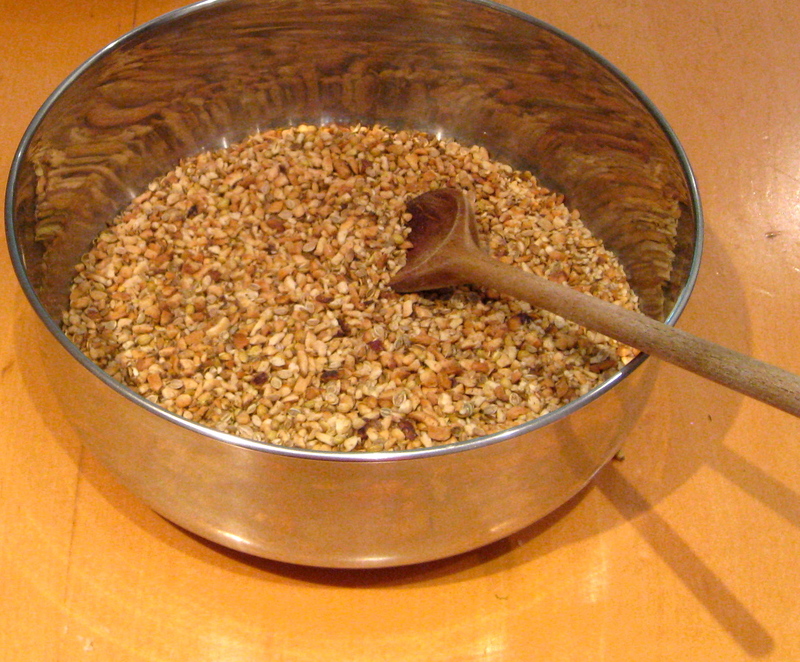 I compared three recipes before embarking on my own dukkah-making adventure. The basic ingredients are nuts, seeds (usually sesame), coriander, and cumin. I ended up using a mixture of ground almonds, peanuts, and walnuts (yes, I was lazy and bought a bag of pre-chopped nuts). The Kitchn says you can add other spices, herbs, or seeds at your will. Preheat the oven to 325F (160C). Spread the nuts and sesame seeds on a baking pan and roast for 5-10 minutes or until they are golden-brown. Chop or grind the nuts after they are toasted and cool. 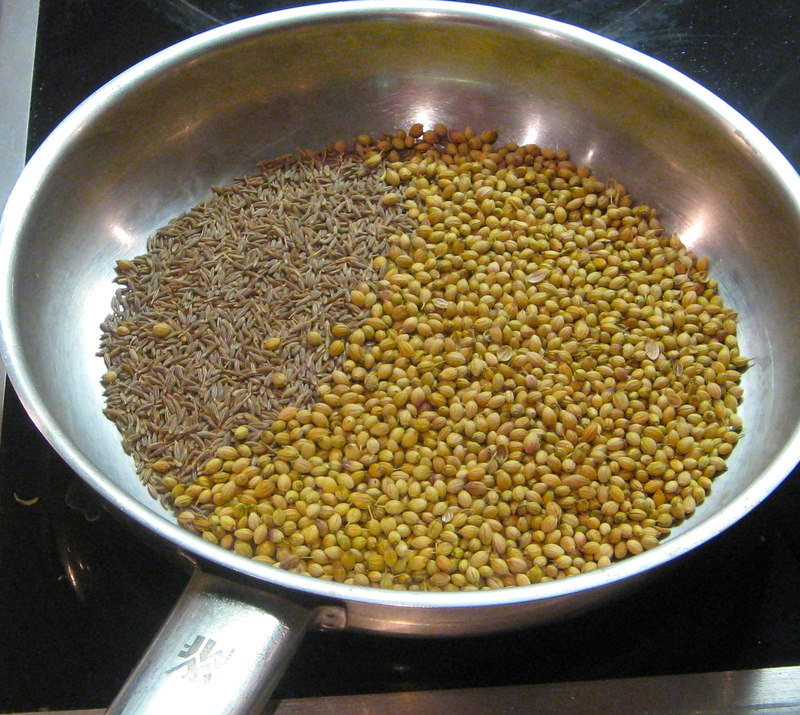 While the nuts are roasting, toast the coriander and cumin seeds in a pan on the stove over medium-high heat, stirring occasionally, until fragrant. Grind the spices with a mortar and pestle. Combine all the ingredients with the salt and pepper in a bowl. Stir and serve. This entry was posted in food, health, pictures, recipes and tagged Middle Eastern on 10.05.2013 by taplatt. We’ve been experimenting with chick peas recently. We wanted to learn how to recreate hummus at home rather than buying it at the store, for frugality’s sake and just for fun. 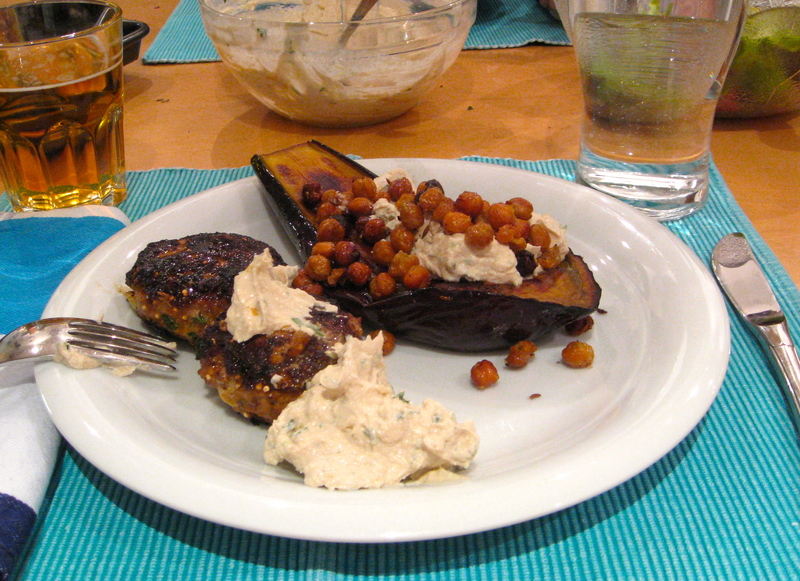 Today I bring you homemade falafel, another great Mediterranean dish featuring chick peas. This recipe was adapted from one over at The Modern Home Kitchen, and the falafel patties turned out really well — they were great reheated, too. I accidentally added quite a bit of cayenne pepper, which made them quite spicy little guys. Luckily, the minty yogurt sauce cut the spice. The falafel were easy to assemble and cook — all you need is some patience to wait during the hour of chilling, and a big appetite to enjoy them! Prepare falafel: In a food processor, combine all the ingredients except the baking powder and flour. Pulse until the mixture is relatively smooth. Add the last two ingredients and blend to combine. Refrigerate for one hour. Meanwhile, make the yogurt sauce by mixing together all the ingredients. Refrigerate. When the falafel mix is done chilling, remove it from the fridge and use your hands to form small balls or patties. 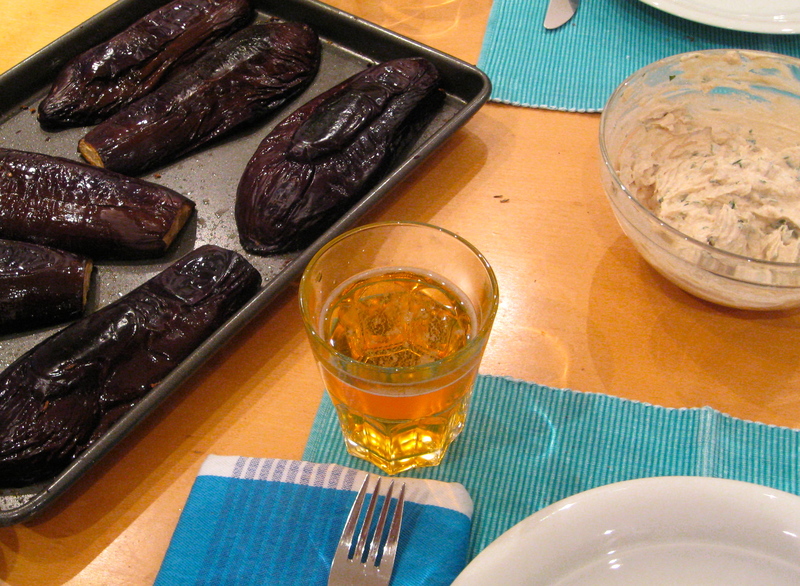 Fry them in oil for 3-5′ per side, or bake at 400F/200C for 10′ per side. Serve with the yogurt sauce, roasted root vegetables and a salad. This entry was posted in food, health, pictures, recipes and tagged Middle Eastern on 25.01.2013 by taplatt. F and I love hummus. It makes such a good snack with a celery or carrot stick and/or some crackers. 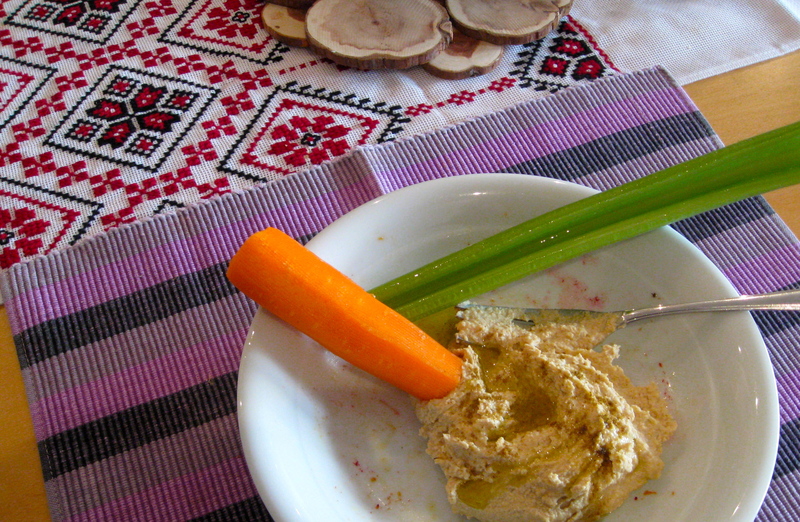 Eating hummus makes you feel a little bit virtuous, too. Most stores sells pre-made hummus, and many brands are delicious. I’ve known for a while that it is not actually that difficult to make from scratch — I just never got around to doing it until F and I were talking about it last week after coming across (yet another) awesome-looking smitten kitchen recipe. She peels her chickpeas, but we decided not to do that. Also I used canned chickpeas (lazy me, I know) rather than dried ones. Despite those changes, the hummus turned out really well; it’s a fun dish because you can personalize its garlicky-ness, lemony-ness and saltiness as much or as little as you wish. Blend the chickpeas in a food processor until they form a coarse meal. 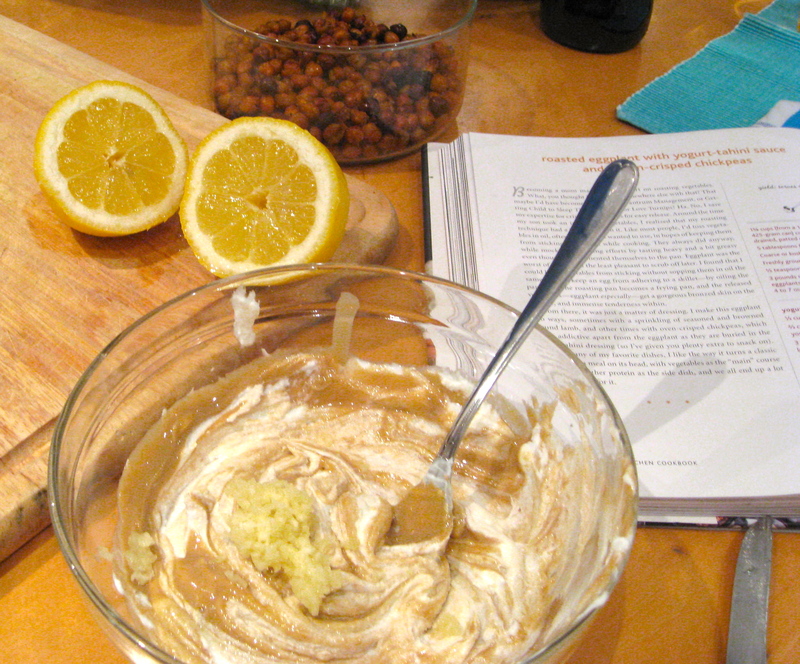 Add the tahini, lemon juice, garlic and salt; blend until smooth, drizzling in tablespoons of water as necessary to get your desire thickness. Rest the hummus for 30′ in the fridge, then serve with a drizzle of olive oil and your choice of veggies, crackers, and/or pita wedges. This entry was posted in food, health, pictures, recipes and tagged Middle Eastern on 19.01.2013 by taplatt.